Many homes and apartments have a sliding glass door also known as a patio door. There are many things that home owners love about sliding doors, such as making the house more attractive and letting in more light. When it comes to sliding doors the things which you see as being attractive is what appeals to a lot of burglars. 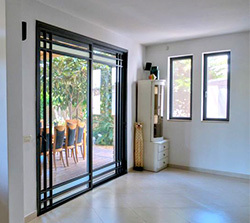 These are the two weak spots that these sliding doors have which impair your home security, which result from the horizontal and vertical movements of the door. Exposed. Many people like sliding glass doors because they act as huge windows, allowing plenty of natural light into the home. But this is also one of the door's biggest downfalls. By leaving your blinds open you are openly advertising your home inventory, which burglars refer to as “advertising". Accessibility. Most sliding doors come with just one door lock that can be easily opened with a screwdriver or forced open, especially for a seasoned burglar. Quiet. Because the doors slide back and forth on a track instead of opening and closing on a hinge, intruders can use this to their advantage. Burglars can gain access to locked sliding glass door by either picking the lock or lifting it off its tracks, in both cases the burglar can enter with little or no sound at all. Although sliding glass doors do have vulnerabilities mentioned above, a few simple measures can help keep intruders at bay. The key factor to securing a sliding glass doors, is to install a mechanism that will prevent an intruder from forcing the door to slide or to lift. Checking that your existing door lock works. In the case that it doesn't work, DIY stores sell replacement locks. Drilling a hole through one door and into the other and inserting a long nail or bolt through the holes. This will prevent burglars from prying the door upwards and swinging out its bottom to gain entry. Fitting a sliding locking device that blocks the track will prevent the door from sliding open. There is also the option to improvise and use a length of wood or metal that fits between the door frame and the stile of the sliding door. To prevent a burglar from breaking the door glass to gain entry, installing a tough window film will stop the glass from shattering and resists a forced entry. A cheap but effective addition to your sliding door security, is Stick on alarms which emit a loud scream should some attempt to open the door. The alarm has a magnet so it can be simply attached to the door. One part of the alarm will be attached to the sliding glass frame and the other part to the door. You can purchase these on Amazon or your local hardware store for less than 10.00 pounds. At Anytime Locksmiths we often received call out requests where clients need their sliding door secured. We can carry out home security assessments, recommend on lock upgrades that will increase your home security. Our technicians can carry out professional lock installations which meet British Insurance requirements and will also allow you peace of mind.